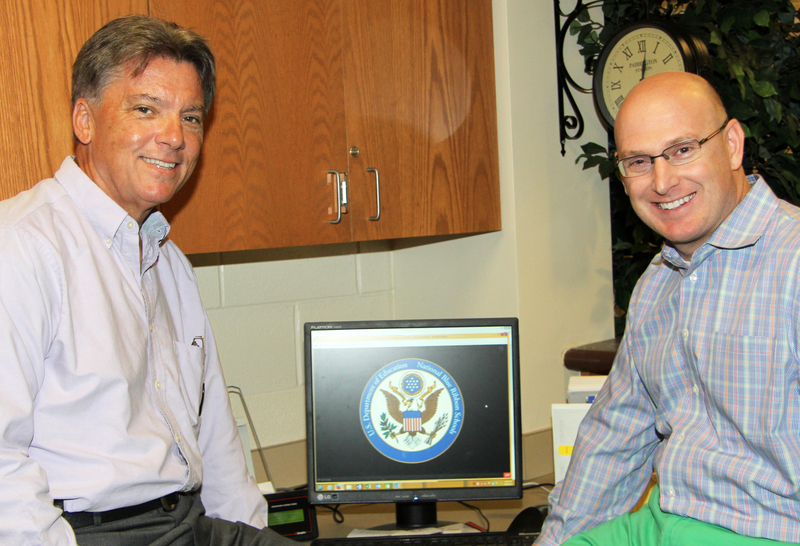 Haysville USD 261 Superintendent Dr. John Burke (left) and Oatville Elementary School Principal Shane Dent watched the computer monitor as they waited for the 2014 National Blue Ribbon School announcement to be streamed live from Washington, D.C.
(WASHINGTON, D.C., September 30, 2014) Haysville USD 261’s Oatville Elementary School was honored today as a 2014 National Blue Ribbon School in the “Exemplary High Performing” Category. Exemplary High Performing Schools are among their state’s highest performing schools as measured by state assessments or nationally normed tests. U.S. Secretary of Education Arne Duncan recognized 337 schools as National Blue Ribbon Schools for 2014 based on their overall academic excellence or their progress in closing achievement gaps among student subgroups. These schools demonstrate that all students can achieve to high levels. The announcement was made live via the U.S. Department of Education’s USTREAM channel and was viewed by recognized principals, teachers, administrators and students assembled across the country. Campus High School was named a 2013 National Blue Ribbon School in the “Exemplary Improving” Category. The Department will honor 287 public and 50 private schools at a recognition ceremony on Nov. 10-11 in Washington, D.C. In its 32-year history, the National Blue Ribbon Schools Program has bestowed this coveted award on just under 7,900 of America’s schools.